The capsule and booster just passed their final pre-flight review and the mission is officially on for Saturday March 2 at 2:48 AM EST/Friday March 1, 11:48 PM PST. So it's to be a night launch, looks like. (They have launch windows since the Dragon has to catch the Space Station in orbit.) 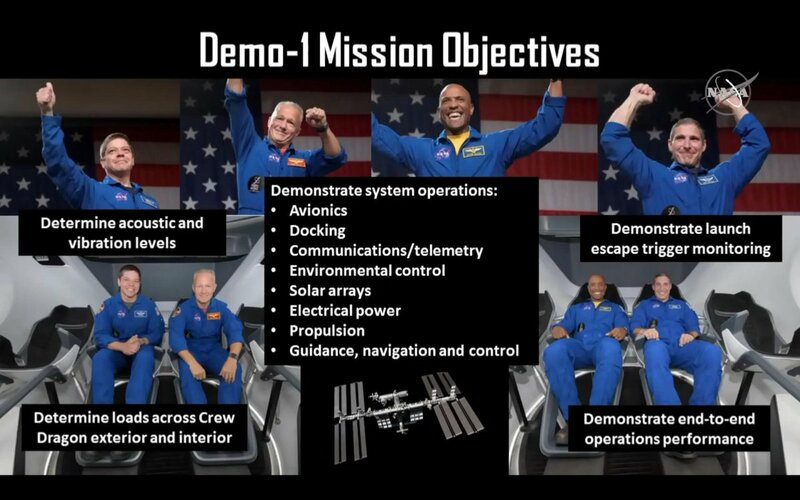 This flight will be the first for the Crew-Dragon and will be an unmanned supply mission much like those currently being flown by the Cargo-Dragons, except with a new capsule. 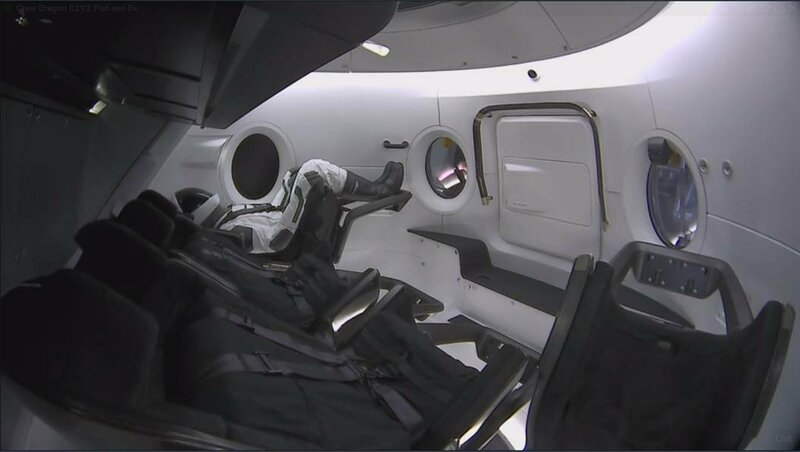 They are testing this new capsule model in preparation for manned flights starting in July, so sending up a fully instrumented mannequin to measure conditions that would be felt by an astronaut in the same acceleration seat actually makes practical as well as aesthetic sense. 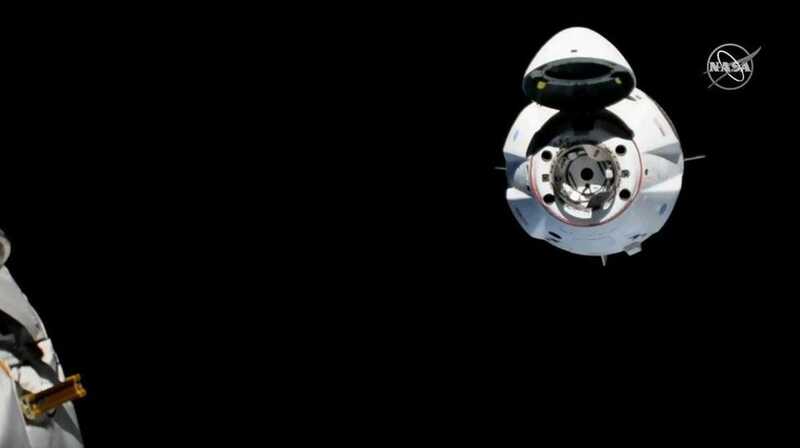 I guess that the Crew-Dragon will depart the Space Station in a couple of weeks and reenter and splash down in the ocean. That will be a dry-run for a manned flight too. Then assuming that all goes well with this mission, between now and July they will fly their in-flight abort test, when they shut off the booster at 'max-Q' (maximum aerodynamic pressure, the worst time for an abort) and fire the capsule's abort rockets to separate it from the booster. (Much like that Soyuz capsule did recently when its booster started to fragment.) NASA has to verify that the system works and that the process is survivable by the capsule's occupants. Assuming that's successful, next step is sending up a capsule test flight ('Demo-2') with two human astronauts aboard in July. (Feb 27, 2019 04:00 AM)Yazata Wrote: They are testing this new capsule model in preparation for manned flights starting in July, so sending up a fully instrumented mannequin to measure conditions that would be felt by an astronaut in the same acceleration seat actually makes practical as well as aesthetic sense. They named the test dummy "Ripley", after Ellen Ripley in the *Alien* movies. Maybe that's supposed to be a deterrent for bringing back a face-hugger to earth. But actually the name only wards off parasitical evil from the mannequin, not potential stowaways in the capsule. 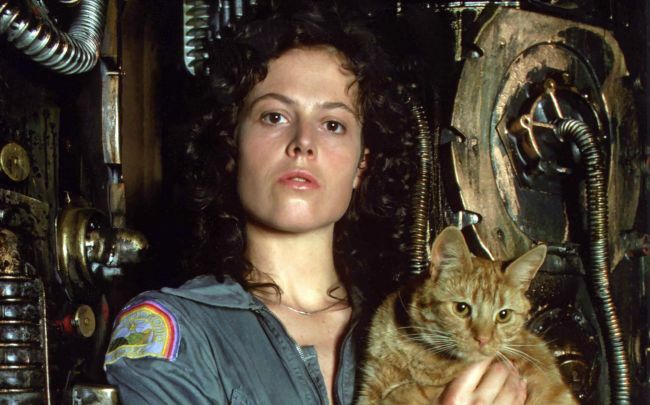 (Mar 1, 2019 02:25 AM)C C Wrote: They named the test dummy "Ripley", after Ellen Ripley in the *Alien* movies. Maybe that's supposed to be a deterrent for bringing back a face-hugger to earth. But actually the name only wards off parasitical evil from the mannequin, not potential stowaways in the capsule. was there some issue or new science around the heat shielding/tiles ? The Crew-Dragon and Ripley launched successfully. The capsule is in orbit, pursuing the space station. Meanwhile the booster landed successfully on its landing barge/drone ship in the Atlantic. Next up is arrival and docking at the space station tomorrow. (Mar 2, 2019 04:55 AM)RainbowUnicorn Wrote: was there some issue or new science around the heat shielding/tiles ? Dragon uses blocks (if not monolithic) made of PICA-X material, which is cheaper to make than the type which NASA used on Stardust's thermal protective shield. There were originally plans for a version of the Dragon that had propulsive landing capability (rather than splashdown). But that was scrapped due to safety concerns -- possibly associated with the legs having to pop out of the heat shield. The "issues" are probably associated instead with SpaceX's "Starship" upper stage of the BFR, which abandons the ceramic/composite tiles for a radical stainless steel (alloy) hull "sandwich that bleeds water". The idea of transpirational cooling has been around since the earliest days of the Cold War space race, but has never been vetted because NASA always had doubts about its viability. Risky because of that historical lack of actual tested usage. if someone gets a space ship wrong & it blows up its big news on the TV and all the space ship company are deemed of questionable character. yet comparatively who knows when some big pharma gets their flu vaccination wrong and they kill 100,000 people and it never makes the news. they say "oops wasn't quite soo effective" but please come & buy the new one at twice the price"
"you may choose if you want the Vaccination, for a very very small amount of people it makes them very very sick, and some get crippled for life or killed by it, but that's a very small percentage and highly unlikely, if you get the diseases, it will cripple you for life most probably and complications may kill you, ... so you may choose because its your life"
i asked them "what would you suggest?" they said "i would take it because statistically your better off"
off hand i think the conversation then went into the right to die if i was stuck in a hospital bed for life as a child and i asked my parents to turn my life support off if that ever happened. there answer was "no we could never do that" i said, its ok though, you can, i give you permission, i would want you to do that". i guess not many parents have such conversations with their high school junior children. (Mar 1, 2019 02:25 AM)C C Wrote: They named the test dummy "Ripley", after Ellen Ripley in the *Alien* movies. I see where AstroAnnimal (astronaut Ann McClain, currently on the Space Station) says that she's ready to meet Ripley in 'person'. Her reply to Elon Musk's tweet proves they really do have internet up there on the Space Station. Quote: Maybe that's supposed to be a deterrent for bringing back a face-hugger to earth. And everyone said that Elon's flamethrowers were crazy. 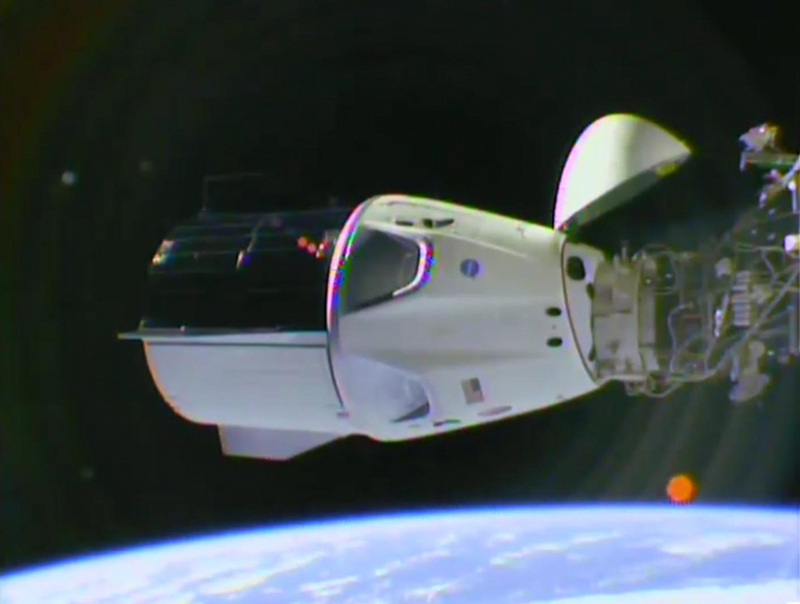 The Crew Dragon, flying in autonomous robot mode, has successfully docked with the Space Station. It was a slow and laborious process that took hours. There were several stations different distances from the station and the Dragon would move to each one, then back away to approach the next closer station. Through it all the astronauts on the Station, along with engineers back at NASA and SpaceX, were carefully monitoring the various rates and system statuses. Finally the Dragon just kind of nudged up to the docking port at a very low velocity in a "soft dock", and then clamps on the Space Station grabbed it and seals mated, in a "hard dock". I suspect that operational docking will be more straight-forward, without all the approaching and backing away stuff, but this is very much a test-flight, of the flight control computers and the autonomous mode, as much as anything else. This image shows the first Space Station astronaut (a Canadian!) 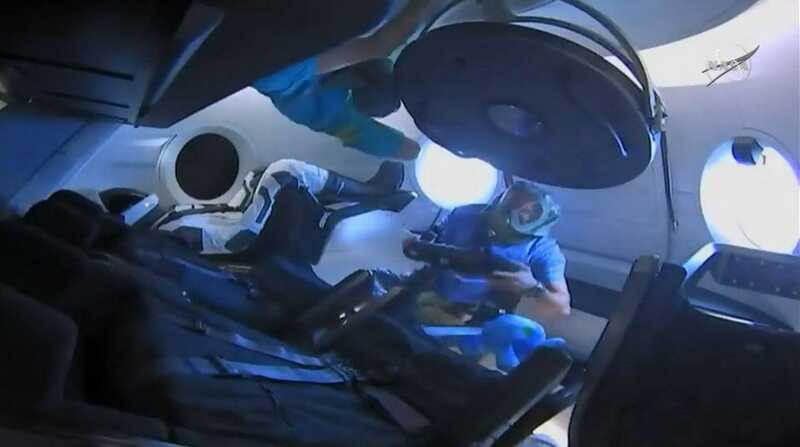 inside the Dragon, wearing a stylish breathing mask, checking to make sure the atmosphere inside was breathable and not filled with some kind of noxious gas. The open hatch is above. 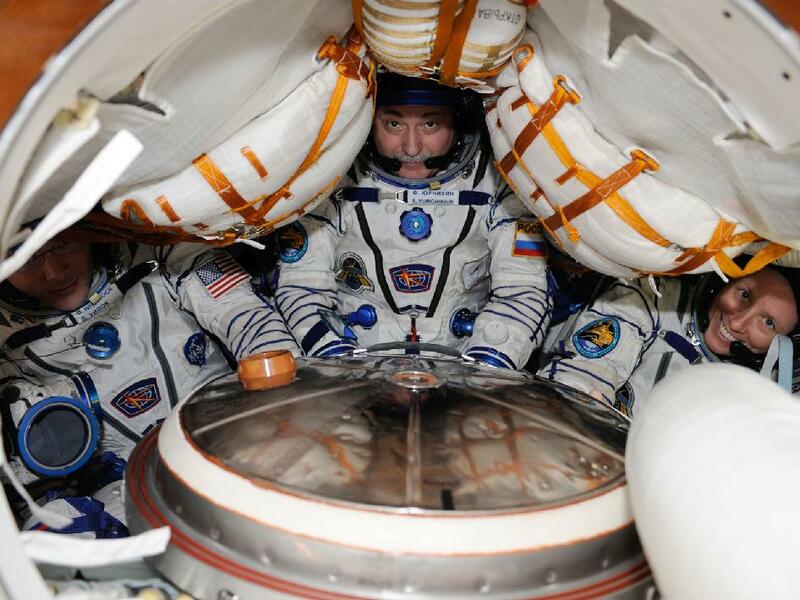 He must have already reported that the air is breathable (I bet that it has that new-car smell, Tesla in this case) since another astronaut seems to be squirming through. Ripley is still in her seat and is paying no attention. In the NASA photo below, apparently taken by a Space Station astronaut from the cupola, I'd say that the orange thing below the Crew Dragon (suckling contentedly on the station's breast) is a lens flare. MR would probably say that it's convincing evidence of... something else.